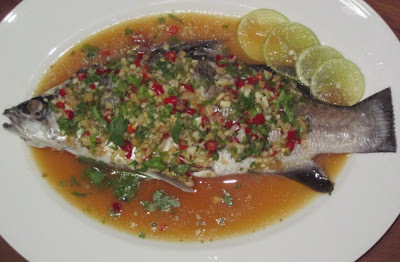 This Spicy Steam Fish is very easy to make. This Sea Bass meat is white, juicy and soft. It’s perfect for steaming in my opinion. I like the spicy lime sauce with coriander that gives the full flavours and aroma. 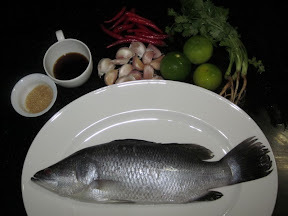 You can adjust the amount of Chilli to your taste and tongue, but the sauce should be a little spicier, so that when we add it to the fish, it will be perfect. Scale the fish, cut the stomach and remove all the insides, clean thoroughly, trim the tail and score diagonally both sides, put aside. Heat up the steamer with high heat, when the water is boiling put the fish to steam for 10- 15 minutes or until cooked. Mix the rest of the ingredients as the topping sauce. When the fish is cooked, rinse out the liquid from the fish plate, add the spicy topping and continue steaming for a few minutes, so the sauce mix into the fish meat. Remove the fish from the steamer and arrange on the serving plate. Serve hot.